Revving up for the upcoming elections in Uttar Pradesh, Prime Minister Narendra Modi inducted three more MPs from the state into his council of ministers on Tuesday, pushing the state's representation to 14. Those making it to the Modi ministry include Apna Dal's Anupriya Patel for Kurmi votes, Krishna Raj, a Pasi, for Dalit votes and Mahendra Nath Pandey, mainly to assuage the Brahmins who were feeling left out. Had junior HRD minister Ram Shankar Katheria not been dropped the total would have been 15. He is expecting a bigger responsibility in the organisation. In the 2014 Lok Sabha elections the Bharatiya Janata Party had won 71 seats from UP but only nine MPs, including Modi and Rajnath Singh, could make it to the Union council of ministers. Others in the original ministry included Kalraj Mishra, Uma Bharti, Maneka Gandhi, Santosh Kumar Gangwar, Sanjeev Kumar Balyan, Gen (retired) VK Singh and Manoj Sinha. Mahesh Sharma, Sadhvi Niranjan Jyoti and Katheria were inducted in the November 2014 reshuffle. The inductions done apparently in consultations with the party president Amit Shah reveal the BJP's game plan for Uttar Pradesh, where it wasn't sure of repeating its Lok Sabha performance of sweeping the polls. In its quest for victory, it is focusing on eastern UP, the other backward castes and the dalits. Bringing in Anupriya Patel after appointing Keshav Prasad Maurya as party president is proof that Modi-Shah combine is depending heavily on the OBC vote bank minus the Yadavs. There's a talk that Rajasthan governor Kalyan Singh's son Rajvir could also be given some responsibility in order to lure the Lodh votes. Together, they would take care of a large chunk of the OBC vote bank. When it comes to Dalits, for some reason the BJP appears unsure of weaning away Jatavs from Mayawati. Hence its alliance with Suheldev Bharatiya Samaj Party led by Om Prakash Rajbhar and now Krishna Raj's appointment as minister. Despite these and its other efforts to woo Dalits, and also what looks like Mayawati's crumbling citadel, the BJP is wary more of the Bahujan Samaj Party than it is of the Samajwadi Party. With Mayawati stitching up a Jatav-Muslim-Brahmin combine, she would appear to be a bigger threat to BJP's dream of forming a government in UP than the SP. And the party is worried about that. Caste combination apart, the party is unrelenting in its focus on eastern UP. Anupriya Patel represents the Kurmi caste which is influential in parts of Varanasi, Mirzapur, Barabanki and Gonda and other parts of east UP. Though she was expelled from the party by her mother Krishna Patel, the lawmaker enjoys the support of the only other MP from her party Haribansh Singh. She would be expected to counter Bihar chief minister Nitish Kumar, also a Kurmi, who is trying to make inroads into the Kurmi vote bank in UP. Like Anupriya, Mahendra Nath Pandey is also from a constituency in eastern UP---Chandauli. Krishna Raj, who was elected from Shahjehanpur, belongs to Faizabad. 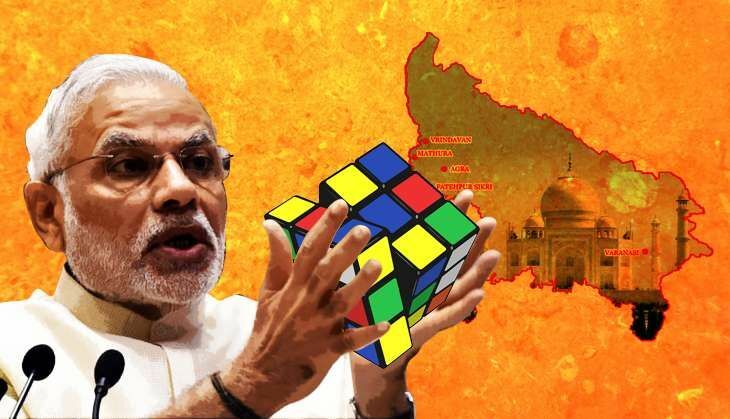 Both Modi and Shah have been travelling frequently to eastern UP districts. The prime minister is again scheduled to visit Gorakhpur where he is expected to announce the revival of the defunct fertiliser factory, setting up an all-India institute of medical sciences and other goodies. Still, the social engineering formula enunciated by Modi and Shah may not yield the desired results once communal issues like Kairana, uniform civil code and triple talaq take precedence.